FRIDAY COCKTAIL - WIMBLEDON'S PIMMS NO. 1! The Kentucky Derby has the Mint Julep, the Preakness has the Black Eyed Susan....and Wimbledon has the Pimm's No. 1 Cocktail. It's origins date back to 1832 when London oyster bar owner James Pimm started offering a gin-based beverage with quinine and secret spices dubbed a digestive aid, served in small tankards known as "No. 1 Cups". 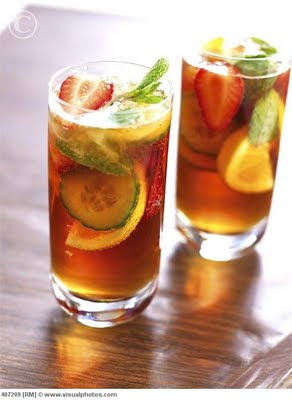 It instantly became popular all over the UK and the first Pimm bar opened at Wimbledon in 1971. Today over 80,000 pints of Pimm's No. 1 Cocktails are sold at Wimbledon every year. LOVE 15, 30 40, DEUCE! So yesterday I found this beautiful piece of Sockeye Salmon and got home and decided I wanted to prepare it differently than I had before. I went to probably 25 websites looking for a glaze for it. I wrote down 19 ingredients from all the recipes and then decided on a method and only 7 ingredients and I had them all in the pantry or refrigerator and you should too!!! Melt the butter and spread it on top of the fish (not on the skin side). Combine salt, pepper and mustard and sprinkle on top of the butter. Warm the honey in the microwave and stir in the balsamic vinegar. Carefully spread a layer of that on top of the spices. 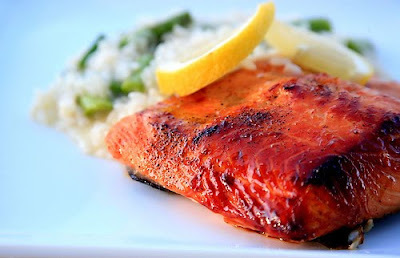 Reserve some marinade for basting and to add on top of the fish when you serve. In a oven proof saute pan, add a little olive oil to cover the bottom and place the fish skin side down in the pan. Cover it and cook on medium-high for about 10 minutes. Take the lid off and baste the fish with more of the honey-vinegar mixture. Place the pan in the oven and cook until your desired doneness (for me about 10 minutes longer - medium rare). Pour a small amount of the marinade on top of the fish and serve. We also added some of the marinade to our asparagus-tomato dish. So easy and absolutely fabulous! This delicious delight is also called Key West Lemonade, made famous at Sloppy Joe's in Key West.....been there...have the T-shirt! Considered one of the sexiest beach cocktails!!!! In a cocktail shaker with ice, combine sour mix, cranberry juice and vodka. Shake and pour into glass filled with ice. 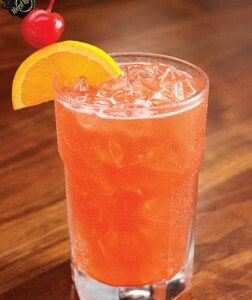 Splash with 7 up and garnish with a lemon slice and cherry. FRIDAY COCKTAIL - PEANUT BUTTER AND JELLY SHOTS! YES, they really really do taste like your childhood delight. You get the peanut butter taste from the hazelnut flavor in Frangelico and the jelly taste for the raspberry flavor of the Chambord. For all my FB friends who find themselves in York Beach...Inn on the Blues makes FABULOUS ONES!!!. 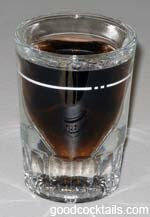 Pour all ingredients in a cocktail shaker with ice and strain into a shot glass. YUMMMYYYY! FRIDAY COCKTAIL - BEER MARGARITAS!!! Sorry I have been gone awhile....busy summer already!!!! I will try to blog more!!! This may sound weird, but the beer is the perfect solution to eliminating that fluorescent GREEN color in your margarita. Use a"not-so-micro" beer to avoid a super strong beer flavor. Use the can of limeade to measure all your ingredients. If you don't like pulp, strain the melted limeade in the water first before adding the other ingredients. Pour the limeade, water, tequila and beer in a pitcher (serves 6). Stir until blended and limeade has melted. Add plenty of ice and garnish with a lime wedge. Add more water if you find it too sweet.